This time of year in Western Pennsylvania, if you are a gardener, you are probably inundated with hot banana peppers. 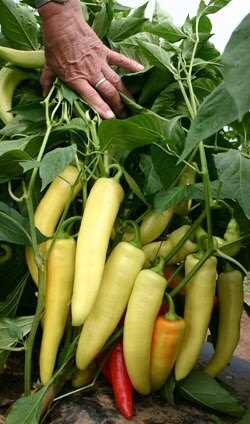 If you are not a gardener, you probably know people who are over-run with banana peppers. Of, if you're like me, you can't resist buying a huge box of hot peppers from your local farmer's market. (Freedom Farms rules, by the way.) Stuffed peppers are really popular, but beyond stuffing them, what to do with these fresh, spicy gems? Heat your grill as hot as you can get it. I have a gas grill, so it's pretty easy to just set all the burners on high and go to town. Line the peppers up on the grill and char them -- you want some nice blackened pepper skin. Depending on the size of your grill, you may have to do this in batches. After they are all charred/blackened, remove them to a large glass bowl and cover with plastic wrap. Let this sit for about 30 minutes, although I usually let them sit for an hour because they're easier to handle. If you've never roasted peppers before, this is the fun part. Just peel off the skin (it's all dry and crinkly, so it comes off pretty cleanly. Pull off the tops and pull out the seeds and the inner ribs. DO NOT run these under water when you do this. You lose some of the pepper flavor that way. You now have roasted hot peppers, an ingredient you can use in a variety of ways (below). If you're roasting your bell peppers, too, simply repeat the process with them. Or, you can go to an Italian market and buy a large jar of good roasted red peppers. There's no shame in this short-cut. Run the roasted peppers (both sweet and hot) through the food processor to make a puree; toss in the garlic and shallot and puree those as well. Heat a deep sautee pan stovetop, and drizzle with olive oil and add the pepper puree and a pinch of salt. Simmer that for about 5 or 10 minutes. Add the can of San Marzano tomatoes and the wine; bring to a boil and reduce to a simmer. This is a fast sauce (once the peppers are roasted, that is), so just let the sauce simmer while you turn your attention to the polenta. One last thing, I like my sauce to be really creamy, so I run about three-quarters of it through the blender to get it really smooth. I use Colavita polenta, but follow the instructions on the package -- usually it's one-half the package (or about 1 1/3 cups of polenta) and 4 cups of liquid. I use 2 cups of water and 2 cups of skim milk. Bring the water and milk to a boil in a saucepan, add a pinch of salt and then slowly add the polenta, stirring furiously as you add it. Continue to cook (stirring constantly) for about 5 to 8 minutes -- you want it to thicken to the point where your whisk almost stands up in the polenta. In the last minute of cooking, toss in a healthy palmful of parmesan cheese and stir until that is absorbed. Remove from heat. Cut the polenta into squares (or rectangles or triangles, whatever suits your aesthetic sensibilities). Heat a non-stick skillet, drizzle lightly with olive oil and pan-fry the polenta squares until crispy on both sides. Serve with the roasted fra diavolo sauce and some grated parmesan cheese. 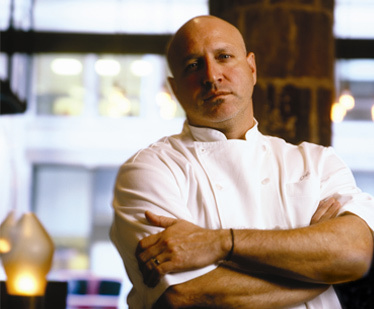 One of my favorite cookbooks is Tom Colicchio's "Think Like a Chef," because it is not simply a collection of recipes (it has those), but because it is constructed in a very chefly way, which is to say, you create elements and then put those elements together to create dishes. One of the elements in Colicchio's book is roasted tomatoes. When you make the roasted tomatoes you create an ingredient that can then be used for a variety of other dishes: roasted tomato, eggplant, zucchini lasagne; or roasted tomato risotto; or sea bass stuffed with roasted tomatoes; or carmelized roasted tomato tarts (transcendent); and there are more, but you get the idea. This time of year, when tomatoes are in full season, I roast many batches and freeze them for use in the winter. I use the roasted tomatoes in some of the pasta sauces I make and I make salsa with the roasted tomatoes, too, but there are endless uses for good roasted tomatoes. Recipes for the salsa and the basic roasted tomatoes here. The roasted hot peppers work the same way. They freeze well. I top burgers with them (any are good this way -- turkey, black bean and beef). You can use the roasted hot peppers in salsas instead of fresh peppers. Or use them to spice up some roasted pork or chicken. Like the tomatoes, there are endless uses for the roasted peppers. So get roasting.